The National Commission on the Affairs of the Displaced People and Refugees, which has recently been formed by the Syrian Coalition, held a teleconference with heads of the provincial councils in Damascus and Aleppo Governorates to discuss the major challenges facing the people who were forcibly displaced by the Assad regime. Head of the Commission Fadi Ibrahim said that the Coalition would spare no effort to ensure that the return of refugees is considered a legitimate, basic right that should not be subject to negotiations as well as to ensure their rights to safely return to their areas and homes. He pointed out that the Coalition has already began extensive work in this regard, adding that the Coalition formed a special work group for this purpose in Geneva and distributed a special booklet on the possible implications and dangers of Law No. 10. Ibrahim stressed the necessity of asserting the rights of the forcibly displaced persons and refugees, especially civilians’ property through the establishment of a database of all civilians who left their homes and areas because of the regime’s threats. He described this as an important step to confront Law 10 through which the Assad regime is seeking to perpetuate forced displacement and demographic change. The Coalition’s political committee established the National Commission on the Affairs of the Displaced People and Refugees with the aim of working to protect the rights and property of the displaced Syrians and to convey their voices and demands. The Commission also works to inform States, organizations, bodies and associations of the reality of the displaced people and refugees as well as to mobilize international support through the holding of workshops highlight their situation in refugee and IDPs camps. The Israeli army has killed 25 Palestinian children in the occupied West Bank and the blockaded Gaza Strip since the beginning of 2018, a rights NGO said Monday. In a press release, Defense for Children International-Palestine, which advocates for the rights of Palestinian children in the Israeli-occupied Palestinian territories, held the Israeli army responsible for the death of 25 children — 21 in the Gaza Strip — this year alone. 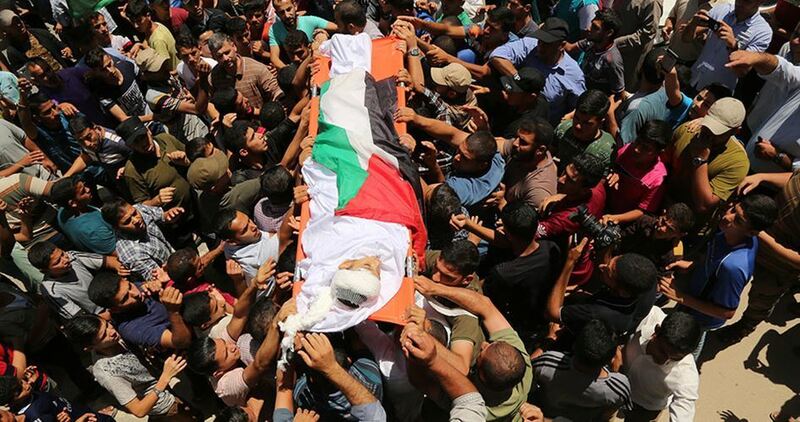 Eighteen children were killed while participating in the Great Return March protests launched since March 30 at the Gaza border, the press release said. It went on to assert that Israeli forces had deliberately killed minors with the use of live ammunition. According to the NGO, this death toll includes 21 children targeted directly, 11 of whom were shot in the head or neck. “The Israeli army continues its escalations using lethal force and live bullets against Palestinian children who pose no direct threat to it,” the NGO’s statement read. The statement concluded by calling for the arrest of the Israeli soldiers responsible for killing or maiming Palestinian children in clear violation of international law. 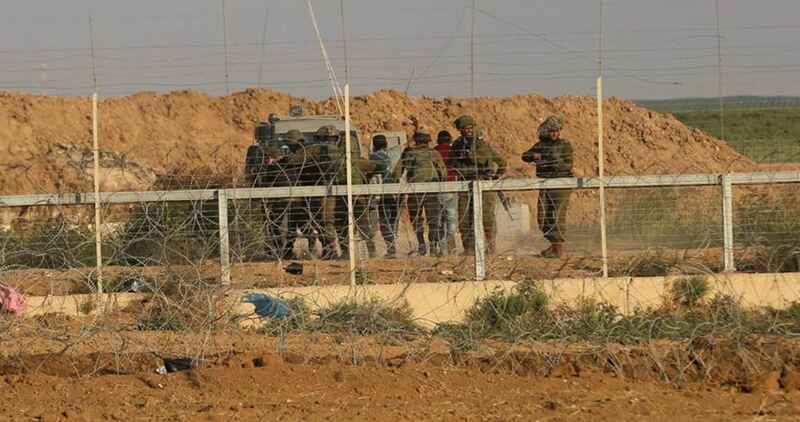 The Israeli occupation forces (IOF) on Monday announced that they killed a Palestinian, detained his body, and arrested two others near the border fence east of Rafah city, south of the Gaza Strip. A spokesman for the Israeli occupation army said in a statement that a group of Palestinian youths crossed the border fence east of Rafah, armed with Molotov cocktails, and attempted to burn an abandoned Israeli military post. The IOF tracked the youths and opened fire at them, according to the spokesman. One was killed and two others were arrested, one of whom was seriously injured. A local source told the PIC reporter that the IOF stationed at the border fence opened fire at a group of Palestinian youths whose fate remained unknown. The source added that the IOF soldiers advanced into eastern Rafah and kidnapped the injured youths. Gaza’s Ministry of Health announced that ambulance crews were able to save a 16-year-old Palestinian shot in the shoulder and transfer him to Yousef al-Najjar Hospital in Rafah city. As many as 128 violations were committed against Palestinian journalists in the occupied West Bank and Gaza Strip in June, a new report revealed. The Committee to Support Palestinian Journalists revealed yesterday that it has documented 54 violations committed by Israeli occupation forces and 74 by Palestinian security services against Palestinian journalists in June. According to the report, Israeli forces attacked 17 journalists in the Gaza Strip and the occupied West Bank including directly assaulting media crews as they covered the Great March of Return. Journalists were left with a variety of injuries as a result. 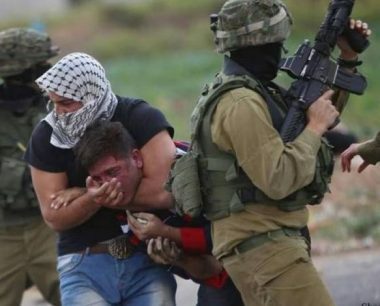 The report also documented nine cases of arrests and detentions including the detention of a foreign journalist in Jerusalem, four cases of raiding journalists’ houses and three cases where journalists’ personal property – including phones and cameras – were confiscated. The committee expressed concern about the increase in the campaign of arrests and prosecutions of Palestinian journalists after the Israeli Knesset approved a new law that prevents the filming of Israeli soldiers in an attempt to cover up their crimes against the Palestinian people. The committee has also documented 74 violations; 53 in the West Bank and 21 in Gaza committed by Palestinian parties against journalists. It also highlighted a rise in the number of attacks by Palestinian security forces in uniforms and civilian clothes against journalists including severe beating, confiscating their cameras and phones and using pepper spray against them as they covered a protest in Ramallah which called for the lifting of Palestinian Authority sanctions imposed on the Gaza Strip. In the Gaza Strip, the committee said that eight journalists were assaulted by men in civilian clothes while performing their duties. The Committee called on the International Federation of Journalists (IFJ) and Reporters Without Borders (RSF) to intervene and pressure Israel to curb its crimes against the Palestinians. The Palestinian Authority’s crackdown on protests in the West Bank in solidarity with the Gaza Strip is proof that it is unwilling to lift the punitive measures it has imposed on the besieged enclave, Hamas said yesterday. According to Felesteen.ps, the movement’s spokesperson Hazem Qasim stressed in a statement that the PA is challenging the nationals consensus and refusing to lift the punitive measures it has imposed on the Gaza Strip. “The PA security services’ crackdown on protests staged in Nablus, which called for lifting the punitive measures imposed on Gaza, is a continuation to the systematic violence adopted by the PA against Palestinians,” Qasim said. The Palestinian Front for the Liberation Palestinian (PFLP) yesterday condemned the Palestinian Authority (PA) and Fatah members’ aggression against a rally organised in the West Bank city of Nablus calling for lifting sanctions imposed on the Gaza Strip, Quds Net reported. In a statement, the PFLP also called for holding the PA and Fatah accountable for this “aggressive” behaviour. The PFLP stressed the importance of maintaining national unity in Nablus, as well as across the whole country based on “real” and “serious” partnership. Hundreds of Palestinians took to the streets of Nablus to show their support for Palestinians living in the besieged Gaza Strip and calling on the PA to end the punitive measures it has taken against the enclave. Australia announced today that it will stop direct aid to Palestine following objections from ministers over “martyr payments”. Australia has previously provided 10 million Australian dollars ($7.4 million) of funding annually to the World Bank’s Palestinian Recovery and Development Trust Fund. The fund enables donors to support the Palestinian Authority’s national policy agenda, which focuses on institution-building activities and development projects. Australian funds will now be redirected to the United Nations’ Humanitarian Fund for the Palestinian Territories, which provides health care, food and water, and sanitation to vulnerable families but does not focus on development. The move will mean Australian funds bypass the PA.
Australian Finance Minister, Julie Bishop, said: “I am concerned that in providing funds for this aspect of the PA’s operations there is an opportunity for it to use its own budget [for] activities that Australia would never support,” according to Australian news network SBS. Bishop wrote to the Palestinian Authority in May seeking assurances that Australian money was not being used to finance so-called “martyr payments”. In a session of the Australian Senate held in June, right-wing minister Eric Abetz called for Australian aid to be cut until these payments ceased. Abetz today welcomed the move to stop direct aid to Palestine, hailing “Minister Bishop’s strong and decisive decision today to ensure that the Palestinian Authority can no longer use our aid to free up money in its budget for state-promoted terrorism,” reported Haaretz. The so-called “martyr payments” refer to the practice by the PA of paying pensions, which could amount to $3,500 a month, to families of those Palestinians killed by Israeli occupation authorities or languishing in Israeli prisons. Other governments have expressed similar concerns. In March, US lawmakers passed legislation, known as the Taylor Force Act, to reduce aid to the PA unless it scrapped the practice. Israeli Prime Minister, Benjamin Netanyahu, called the US law a “powerful signal” to the PA.
Undercover Israeli soldiers infiltrated, on Monday at night, into Beit Jala city, north of the West Bank city of Bethlehem, and kidnapped a young Palestinian man. Dressed as civilians, the soldiers, driving a car with Palestinian license plates, broke into a coffeeshop in the Sahl area in Beit Jala, kidnapped Hasan Mohammad Zaghari, 24, and drove away. The young man, from the Deheishe refugee camp, south of Bethlehem, was then handed to a regular army unit waiting nearby by, and was taken to an unknown destination. Israeli soldiers demolished, Monday a carwash facility, and a barn, owned by Palestinians from occupied East Jerusalem. 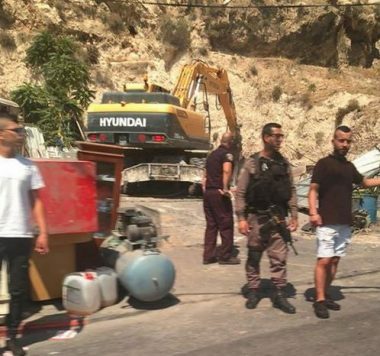 The soldiers, accompanied by personnel from the Jerusalem City Council, invaded Wadi Qaddoum area, in Silwan town, south of the Al-Aqsa Mosque, and demolished a carwash facility. The army also invaded Umm Tuba village, south of Jerusalem, and demolished a barn owned by a Palestinian shepherd. The demolitions took place after dozens of soldiers, accompanied by bulldozers, invaded Silwan and Umm Tuba, and encircled the two areas, before surrounding the targeted structures. The Israeli army claimed the structures were built “without permits” from the City Council, in the occupied city. Israeli occupation forces and officials visited the Palestinian community of Khan Al-Ahmar in the central West Bank yesterday in preparation for the expulsion of the village’s residents. In a press release, Israeli human rights group B’Tselem said that Israeli occupation personnel “walked through Khan Al-Ahmar, among the residents’ homes, in what appeared to be preparations for the planned demolition of the community”. An Israeli official confirmed to Haaretz that the “measurement-taking” had taken place, while a village resident told the paper that the Israeli occupation forces “walked around the houses, entered the ecological school (the well-known one made of tyres, which is also slated for demolition), and counted the flocks of sheep. He said the children who were in the school fled in panic”. According to B’Tselem, “residents reported that a police officer told them they would be forcibly removed and that they would be better off if they left ‘voluntarily’”. The police officer apparently “declined to name the date of the transfer”. As recounted by the NGO, on 24 May, the Israeli Supreme Court “ruled that the state may demolish the homes of the community of Khan Al-Ahmar and transfer the residents from their homes”. “This ruling removes the last impediment which had thus far served to defer the transfer of the community, a war crime under international law,” B’Tselem added.